THE Chesterfield Canal is looking very tidy this autumn thanks to dozens of volunteers helping to cut back overgrown vegetation. The programme is being organised by the Chesterfield Canal Trust working in partnership with the Canal & River Trust. By the end of the programme in December, the whole of the eastern end of the canal will have been cleared—a total of 31 miles, with the volunteers using the Chesterfield Canal Trust’s 89 year old workboat, Python, to reach overhanging branches on the off bank. The first sessions taking place in September with this year Python already being out for 31 days. 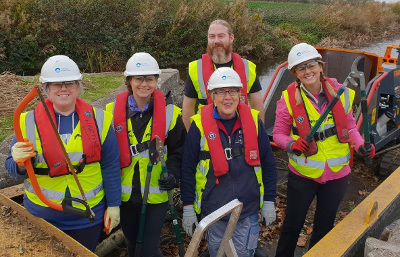 Most of the volunteers are members of one of the two Trusts, but a few are members of neither but want to do their bit for a canal that they love. Python is always skippered by an experienced crew, with all the required kit, including personal protection equipment, being provided by C&RT. Last year, all the vegetation was cut up and put into huge builders’ bags, unloaded at an agreed site and then collected and disposed of by C&RT. This year, it provided a hopper for Python to tow with a wood chipper stowed in its hold. It also provided chipper training for key team members, so that everything could be disposed of much more easily in an environmentally sound manner on site. Interestingly, some volunteers have come from local businesses which see this work as part of their Corporate Social Responsibility. This is an area of volunteering that the Chesterfield Canal Trust will be developing in the coming months across several of its activities. “The arrangement we have with the hopper and chipper is making the vegetation cutting process much more efficient; volunteers are clearing far more than was managed last year. The team is amazing and I have had full confidence in their ability to get the job done in a safe and efficient manner. The volunteer numbers are incredible.